The EMO Hannover World Tour begins in mid-January 2019. Start is Vietnam. The next stops are Malaysia, Indonesia and Thailand. This will be followed by 35 further events in 30 countries until June. 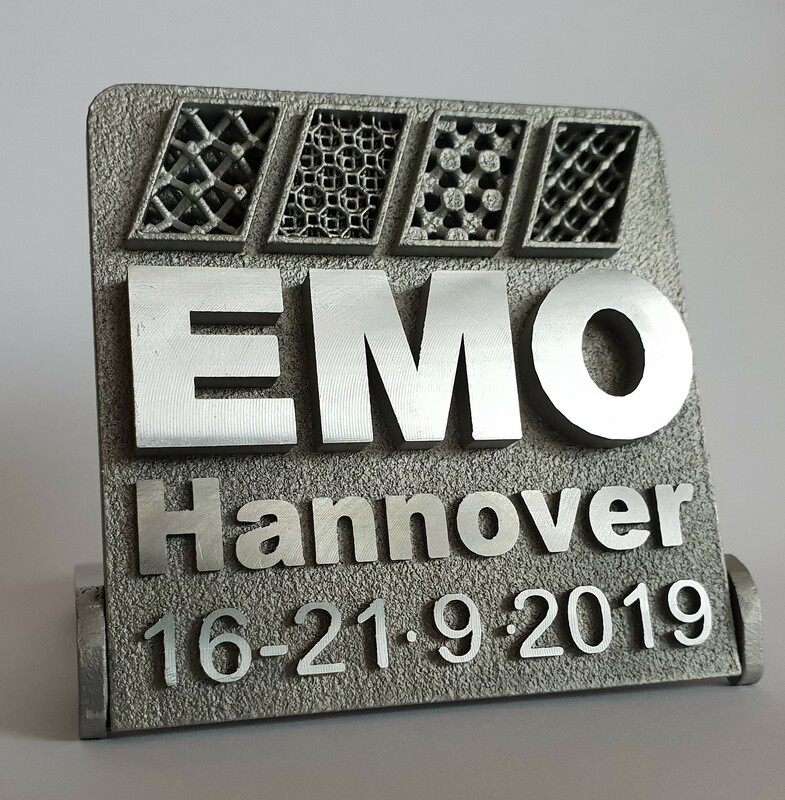 Representatives of the EMO organiser VDW (Ger-man Machine Tool Builders’ Association) and its cooperation partner Deutsche Messe AG will present EMO Hannover and its special features to journalists from all media categories. The EMO World Tour begins on January 15, 2019. It will lead from Asia via Europe and the Americas once around the world. In total, 39 press conferences are planned in 34 countries. The EMO World Tour’s aim is to inform business leaders, buyers, researchers, developers and other production experts from industry worldwide about their regional media at an early stage. Which trends determine the industrial production of tomorrow? What’s new in production technology? 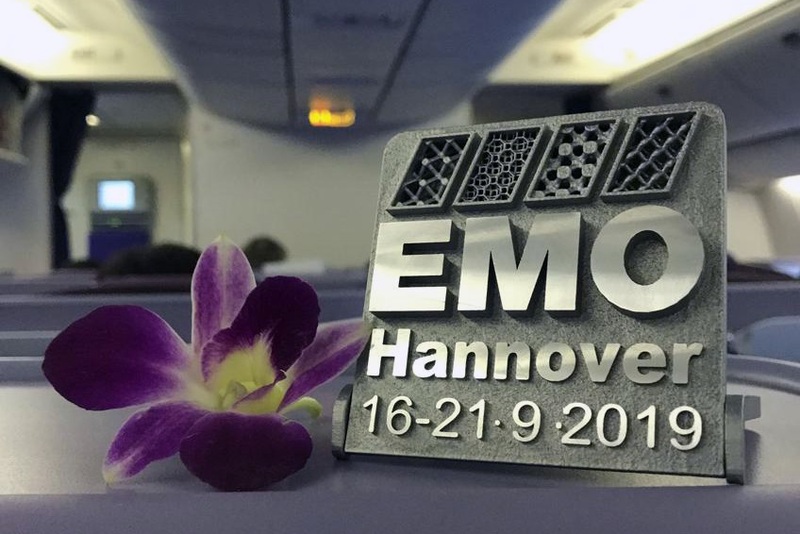 And what will the international exhibitors at EMO Hannover show in concrete terms under the motto Smart technologies driving tomorrow’s production! A metal EMO logo is particularly prominent on the lectern of every press conference. It visualises the EMO brand on the one hand and an important technology trend on the other, additive manufacturing. 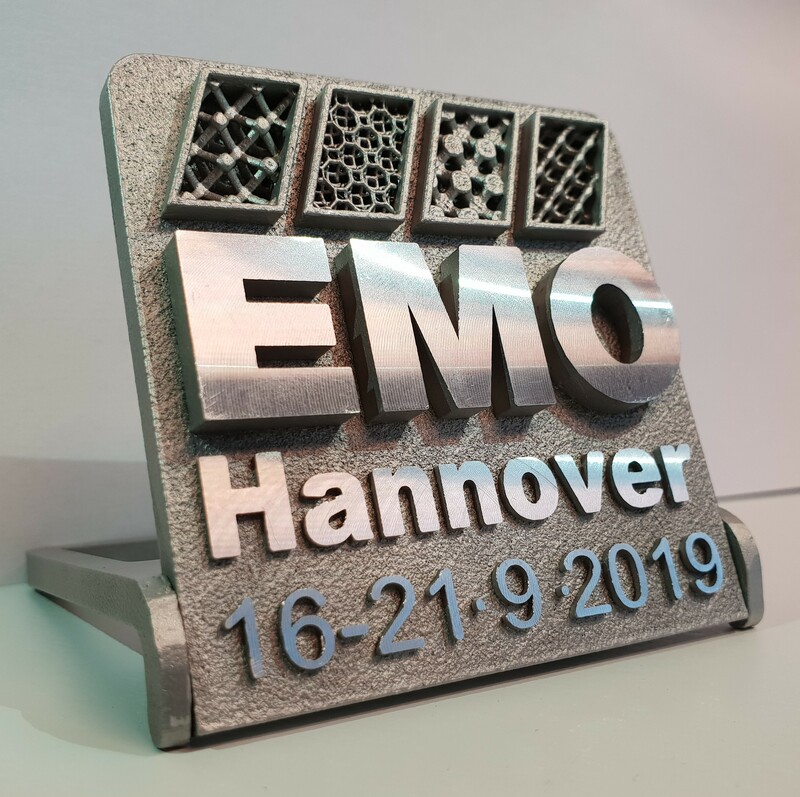 Renishaw GmbH, based in Pliezhausen, Baden-Württemberg, with its British parent company, EMO exhibitor for many years and active in the additives business since 2011, has produced an EMO logo with a hinged construction directly from the powder bed. It measures 78 x 72 x 15 mm, can even be folded out to 78 x 140 x 10 mm, and weighs approx. 140 g. “The highlight: the folding construction was printed directly, so that both parts come out of the printer in one piece”, says Rainer Lotz, Managing Director at Renishaw. “And the grid structure that is part of the logo can only be produced using the 3D printing process,” he continues. All in all, the good piece was produced in batch size 3. One RenAM500Q with four laser beams worked seven to eight hours per copy. “The biggest challenge with this very spontaneous project was initially the short time, because all our experts were naturally working to capacity,” reports Lotz. Then, however, a team of several people put a lot of effort into completing everything on time. A design engineer for the design, an additive expert for the manufacturing process and a production expert for the post-processing were also involved. “In the end, everything fit. The design could be implemented very quickly and stringently in production. That’s the charm of the additive process!” Lotz says. Anyone interested can of course visit Renishaw at EMO Hannover. For the first time the additive manufacturing circle can be seen there. It shows the entire process chain of additive manufacturing. A short production video can be found here as well as on Youtube.